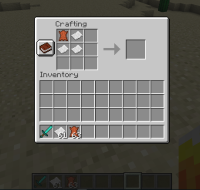 Book crafting recipe stopped working, you can't unlock it getting all the materials, I tried that with the gamerule doLimitedCrafting and it still doesn't work. MC-115080 Book recipe not working ? MC-115108 Crafting recipe for book removed. MC-115345 Cannot craft a book with paper and leather! MC-115358 Not able to craft a book item! MC-115441 The book has no recipe, and it's not craftable. MC-115616 I can't craft a book.